But the shift towards content marketing can also be credited to Google. In February 2011, Google launched the now infamous Panda update that penalized websites for low quality and thin content. The chart below from Google Trends clearly shows a major increase in ‘content marketing’ searches since February 2011. An if that wasn’t enough Google launched Penguin in April 2011, an update to the algorithm that penalized websites with low quality links and over-optimization. Both of these updates lead to a change in the SEO industry. 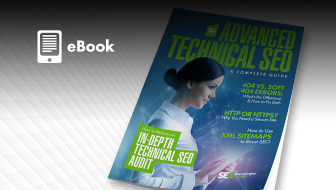 Pre-2011, SEO techniques may have involved automating content and links in order to get websites to rank higher in search. Post-April 2012, these techniques no longer work. Now links need to be acquired naturally through websites and social sharing, and the only way content will be shared on the web is if it is of high quality. If you don’t have a content marketing strategy, you are losing business to your competition. The report also covered the biggest challenges that B2B Marketers face with content marketing, with 64% citing the biggest challenge was producing enough content. This post aims to reduce that percentage. These 20 ideas for content marketing cover a range of media for you to promote your brand with. They include video, audio, white papers, blog topics, surveys and more. Let’s get started! 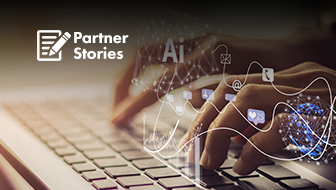 Interviewing industry connections provides a great source of content that is engaging to your audience; insightful content from industry leaders. 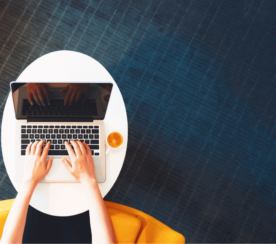 By displaying this content in the form of blog posts or webinars, you are generating high quality, link-worthy content and increasing industry leader’s exposure. Tip: Use LinkedIn to network and ask connections to appear on your blog or in a webinar. Using my own personal network on LinkedIn, I was able to feature Neil Patel, Linda Bustos and Rank Fishkin on my blog. What is your biggest [industry] challenge? What stopped you from subscribing today? How often do you buy [insert product]? 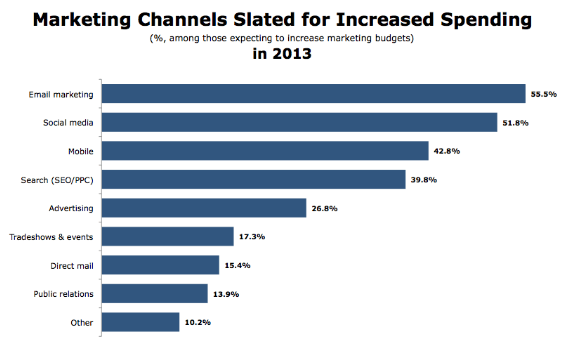 In 2014, what marketing channel will you increase the budget for? Using the data in the example below from Marketingcharts.com, you are able to share insight such as ‘42% of marketers will increase mobile marketing spend in 2013’. Once you have collected enough data, create a summary in the form of a blog post and share this with your readers. Tip: Get started immediately and use Facebook, Google+ or Twitter to survey fans and followers. Tip: Alternate takeaway posts between webinars, whitepapers, industry events or books to keep content fresh. Each time you give a speech, presentation or hold a webinar you will most likely use a presentation for support. Use this presentation (remove sensitive information) and share it with your community. SlideShare makes it quick and easy to share presentation slides and this is a great opportunity for displaying your expertise and increasing awareness for the next time you hold an event. Tip: Get your subscribers engaged with your content from day one by including a link to your most viewed slideshare presentation within the newsletter sign up welcome email. FAQ’s are found on most websites, yet are not particularly useful. Create a more content driven FAQ section by identifying the top 10 complaints or questions customers wrote about in 2012 and build a content program (or knowledge base) to help answer those questions. Tip: Find the most asked question of the week and turn it into a weekly Q&A blog series. The easiest way to find a topic for a webinar is to create a webinar about your company and what you do. Webinars can be created using services like WebEx or GoToMeeting. 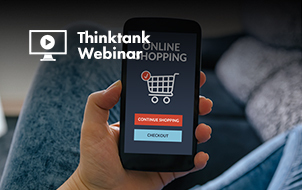 Set a date for the webinar, create a landing page for participants to register and then send out a newsletter to your customer database and inform them. Make sure you support the webinar with a PowerPoint presentation and record the webinar. 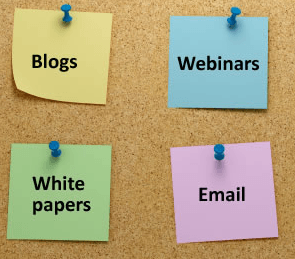 One of the benefits of holding a webinar is that you can use the webinar content to promote in several channels. 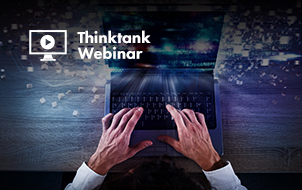 For example, instead of archiving the landing page for registration, update the content to include the webinar video and copy and paste the transcript below it. Tip: Make sure you post the webinar presentation on SlideShare and send a newsletter all participants of the webinar and link to the updated landing page and SlideShare presentation. There is a lot of data out there. From industry trends, company reports to usage statistics. It’s difficult to stay on top of them all and read through the hundreds and thousands of reports created each year. One way to remain on top of this is for your brand to create a Pinterest account and each time an employee reads a white paper, they can share key information on Pinterest. Set the account public and you will be the go-to Pinterest account for industry trends. Tip: Make sure this information is shared with your sales force for them to use the data when meeting prospects. You can also use Infographics to create a ‘History of…” topic within your niche. Infographics prices can vary and I have found prices anywhere between $500 and $4000. Tip: Infographics should contain no more than 5-6 statistics/ points of information. Research by KISSmetrics found that any more than 6 and it becomes too much for the reader to consume. More than likely, you have either seen or signed up to an online email course. You enter your email address and for the next seven days, you will receive tips and tricks on a specific topic. These newsletter series are goldmines for lead generation and increasing your subscriber base, but just make sure you get the subscriber to double opt-in and re-confirm their email address – you don’t want to send the course to spammers or bots. All you need to do is collect at least 7 pieces of content (all of which could be on your website or blog), include a link to the content and send an email each day to those who have signed up. Tip: On day 7, include a link to a free trial or free demo of your software to turn those readers into buyers! If you attend a seminar this year, conference or event, live blog the entire thing on your blog or Twitter account. The way to live blog is to publish updates on key findings, important data and research. Each time you publish an update, include the time, the speaker (either by name or Twitter handle) and the key piece of information. Tip: If you live-blog an event on Twitter, make sure you include the hash tag (#) for the event to increase your reach. Industry leaders and experts exist within each industry. A great way to create share-able content is to create a list of the top 10 bloggers to follow within your industry. Everyone loves to be recognized for their vision and expertise. Include a link to each blog and an image, and follow the bloggers on Twitter – When you publish the post, the bloggers will most likely re-tweet it for you. Tip: Before you publish the post, send a short email to the blogger and inform them that they made the list. It’s a great ego-boost and in return they might blog/ tweet about your company. You no longer need a publisher to launch a book into the market. Sites such as Blurb and Amazon publishing allow you to create an e-book with ease. Instead of trying to write a biography or the entire history of your brand, take your most read blog posts (Between 20-25 posts), condense them into one booklet, create an introduction, table of content and cover page and launch as an e-book. According to research by Statista e-book spending continues to grow. Not only can an e-book increase your brand awareness but it could also add another revenue stream to your business. Tip: If you have enough content on your blog, make the e-book an annual event and collect the most read posts each year. And submit your e-book to DocStoc, Calameo and GetFreeEBooks to increase awareness and inform your customer base of the publication. Beginners Guides are always well-received pieces of content. Within your website visitors, you will have beginners, those who are just getting started and looking for a product or service, the intermediate who has perhaps bought or subscribed to your product/ service and the advanced user who has years of experience. 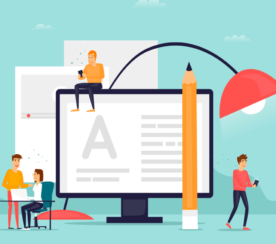 Most company websites are written by the advanced users, but there is a huge opportunity to turn the beginners into advanced users by creating a guide. By capturing beginners at the top of the funnel, you can guide them through the entire sales cycle. Tip: Make the content freely available on the website and create a downloadable PDF for those who want to print out the entire guide. You’re sales teams are out on the road meeting with prospects and customers. They know the product very well, and they know a lot of the answers to questions asked in these meetings. Ask your sales manager the top 10 frequently asked questions and publish the questions and answers on your website. Tip: Complete the same process with your customer service teams and gain insight into what questions your customer base is asking. Eric Schmidt once famously said that “there is more content being produced in the last 48 hours than between the beginning of time and 2003”. That’s an incredible amount of content that you will have to compete against. 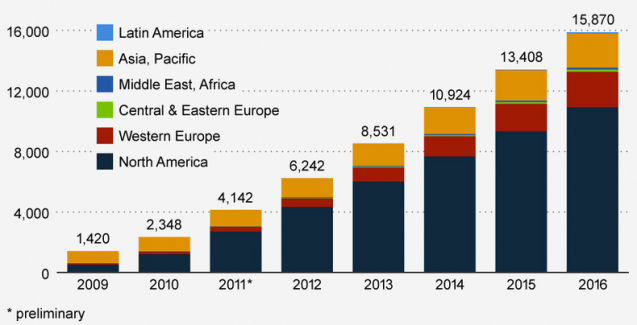 In 2011, approximately 25% of Americans listen to podcasts regularly and this number continues to grow. Instead of being added to yet another “read later” list, why not turn your blog posts into a podcast? Tip: Use iSpeech to automatically convert your blog into a podcast. You don’t need to record it yourself as iSpeech does that for you. Getting your customers to spread the word about how good your company is priceless. Using social networks, you will be able to pinpoint who brand advocates are; the fans who comment and share each post, the followers who re-tweet your tweets and the users who +1 your Google+ posts. Ask these users to create a video testimonial in return for a free product or gift and post the video on your website. Offer an incentive such as a free month’s subscription or free consultation to increase the number of testimonials you receive. Tip: Use these video testimonials on your home page, thank you emails to share the positive feedback you have received from real people. 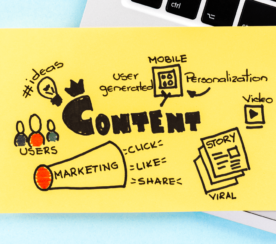 Recent research has found that content with more than 2,000 words ranks higher in Google than content with less than 2,000 words – That’s great insight for your content marketing strategy – Aim for lengthy-written content and you will do better in search and attract more traffic. Instead of trying to think of a topic for a white paper, you may already have a white paper that is currently written as a blog post. 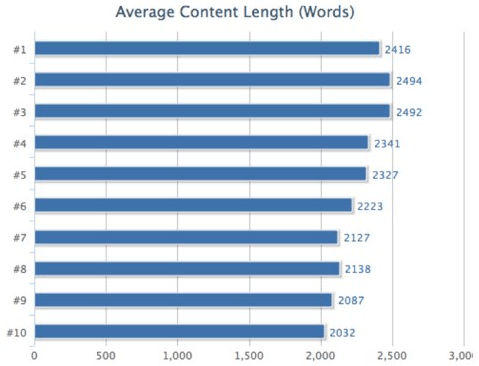 If you have a blog post that is more than 1,500 words, you can turn this into a white paper. All you need to do is create a cover page, a table of contents and a summary. Tip: When creating white papers, you can also summarize the key findings into an Infographic and a blog post to turn one piece of great content into three pieces of content. Like most B2B Marketers, you will catch up on the latest news in your industry by reading a wide-range of blogs. If you find that you visit the same blogs daily, and the content provided is high quality, there is no harm in sharing this with your readers. By creating a top 10 blog posts of the month, you are able to further spread the good work of others in your industry. Tip: Create an alltop.com board or bookmark an existing one to follow the latest blog posts and reports from your industry. At SuperOffice, we use crm.alltop.com to stay up to date on all CRM trends. Meeting decision makers face to face and understanding their needs is the best way to increase your client base. A great way to connect with hundreds of potential customers is to host an event or seminar in your area. Promote your event on websites like Meetup.com, which allows you to create a page for your event that includes date, location, organizer and attendees. With more than 13 million members, Meetup.com users can then search for events/ conferences in their area and register. Tip: Remember to create a landing page on your website in order to promote the event to existing web traffic and use social channels to spread the word that you are hosting the event. Once you have exhausted all of the suggestions listed above and you are a content marketing expert, a great way to reach a new audience is to offer guest posts on your site. Create a form on your website that guest bloggers can complete to reach out to you. Ask for examples of blogs they have previously written and make sure the blogs are in tune with your blog strategy and are high in quality. If your form doesn’t generate the quality guest posters you need, you can sign up to MyBlogGuest or BloggerLinkUp and access thousands of guest bloggers. Tip: Ensure that the guest blogger has a Google+ profile so you can provide author rank for them. 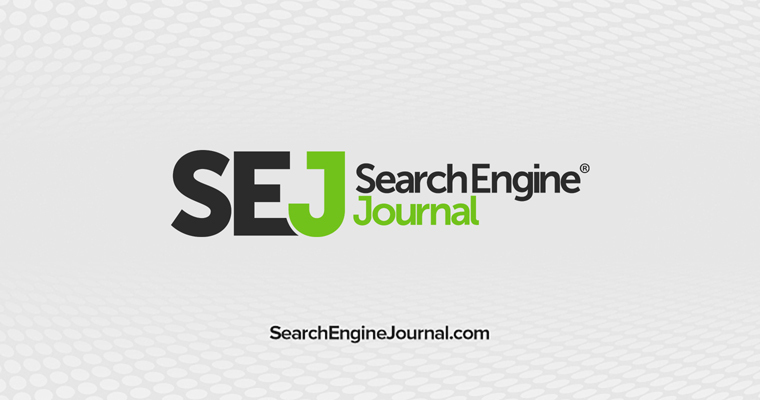 It means the guest blog they write stands out in the Google search results, which means more traffic for you. Organizations are slow to adopt to content marketing. Whether it’s due to resources or budgets, you need internal buy-in before you start creating a lot of content. Many brands have had great success with content marketing. Here are just a few reasons why you should invest in this tactic. Not only are brands seeing an increase in traffic, customers and revenue but content marketing has a wide range of benefits. And according to HubSpot, businesses with websites between 400 and 1000 pages received 600% more leads than websites with less than 400. Content marketing is still in its infancy yet has been widely adopted by marketers worldwide. The growth in content marketing usage, spend and importance means that if you are not implementing a content strategy, you will be left behind by your competition. Build content in a way that puts your brand top of mind. Your industry expertise needs to be shared in a way that can be accessed by your audience. By focusing on creative content, you will be able to attract visitors, links, social shares, referrals and an increase in your revenues. A low-cost tactic for a high-income reward so start creating content now! What content marketing suggestions do you have for 2013? Feel free to comment below.